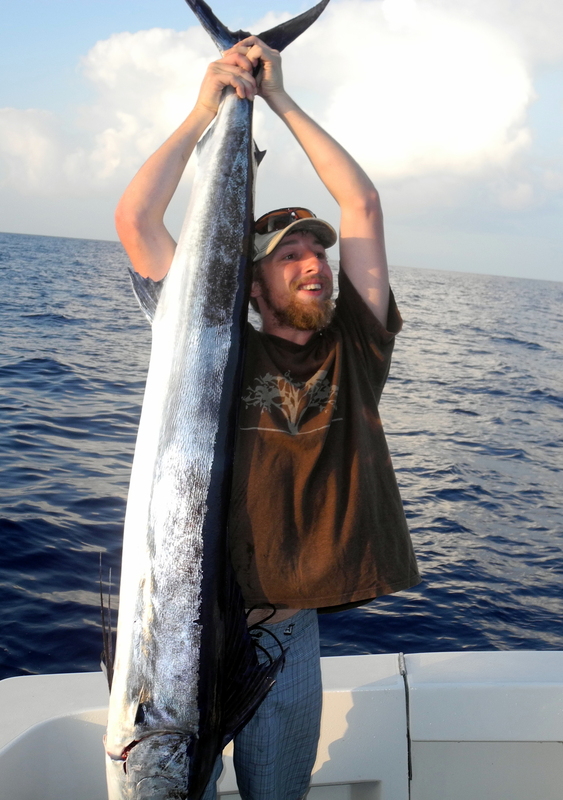 First Mate Adam Ludwig releasing one of the two marlin caught today. Marlin Double Feature! On Saturday, first mate Adam Ludwig and I found ourselves in a very wild battle with more than 1,200 pounds of Blue Marlin. 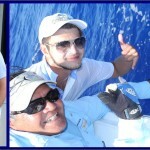 We had a Father-and-son party from Australia aboard. Peter Dalle-Nagare and his son, Kyle along with their family boarded Fire Hatt and we headed off shore and then out to “C Buoy” . It was an uneventful ride up to this point so we headed back up the line inside. 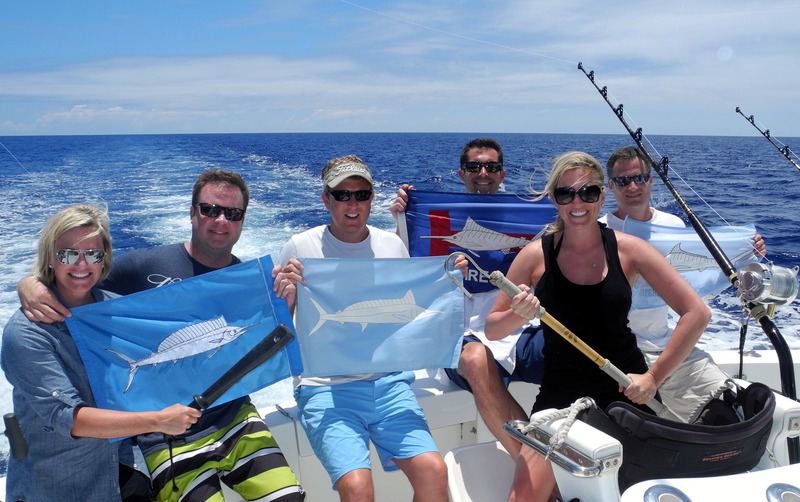 At around noon, we were trolling off Captain Cook in around 500 fathoms. The water was glassy calm, which would be a help in the battle to come. I had just reassured my anglers that there was a lot of good trolling water around them when the stinger line started screaming and took over the dialogue. 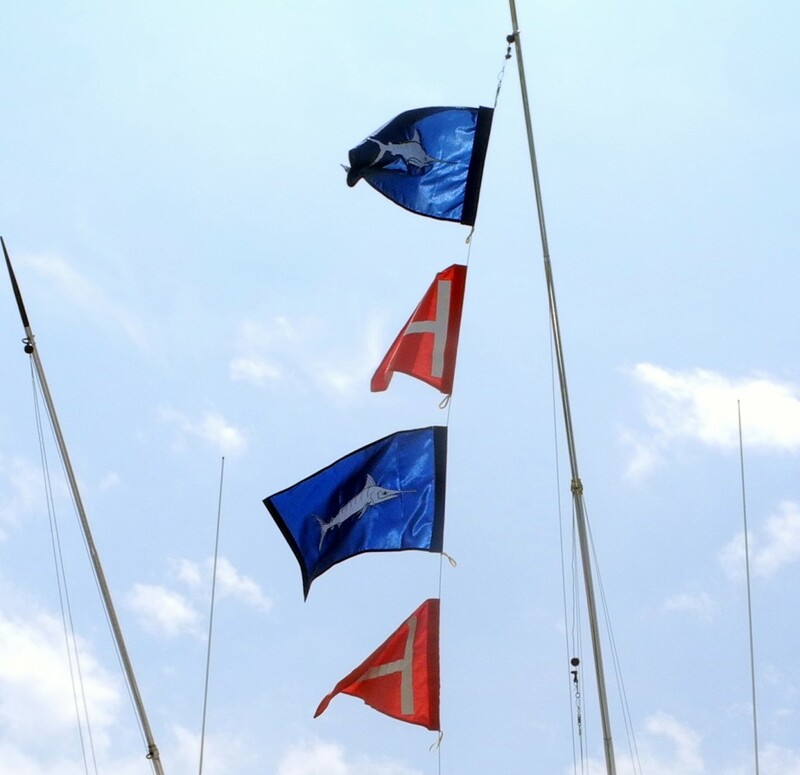 A 500-pound marlin had grabbed a John Lau lure on the stinger line and then took to the air in an almost continuous tail-walk for nearly two minutes. Peter is in the chair just starting his battle when I slowed the boat so Adam could start clearing the lines so we could chase the fish. 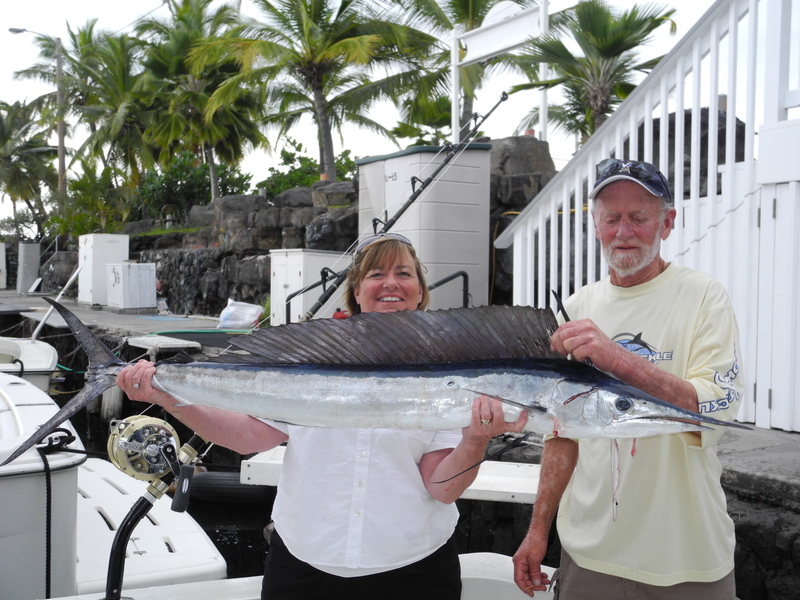 As Adam reeled in the Aloha Smash Bait lure on the short outrigger, an even bigger marlin charged it. 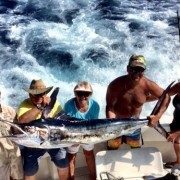 We were almost in idle when the marlin showed. The lure was back at about the third wave so we could easily see its big bill, big head and big shoulders. Then, wham, we were now hooked up to two big fish at once. The second marlin screamed off about 500 yards of line, which caused a great predicament. Which fish do we follow and try to get first (if at all)? 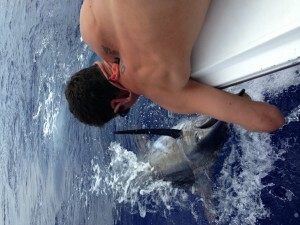 Fortunately, the first two minutes of intense acrobatic effort had taken a lot of steam out of the first marlin. 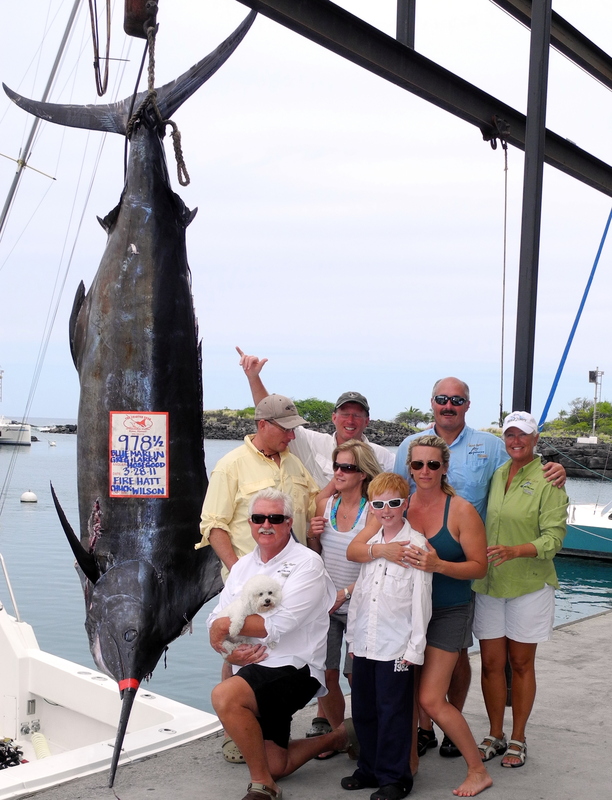 The second fish, estimated at 725 or more pounds, had headed off in a different direction so there was no present danger of getting the lines crossed and tangled. By then, we had gotten all of our gear out of the way by raising the outriggers and transferring all of their rods into the cabin. While Peter fought his fish from the chair, Kyle fought his fish from a rod holder on the gunwale. Depending on which fish was giving the most trouble at the time, I eased the pressure on the anglers by crabbing the boat sideways in one direction and then the other. 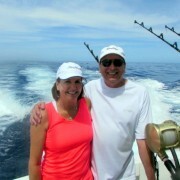 The tactic was to keep one fish at 4 o’clock and the other at 8 o’clock to avoid crossed and cut off lines. 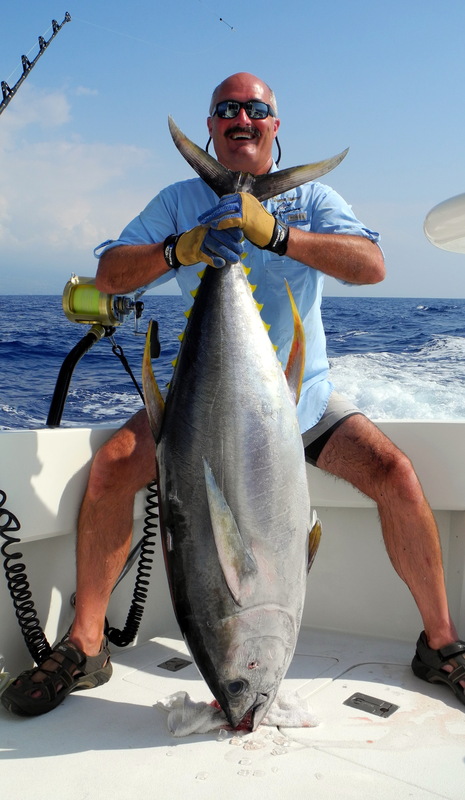 With smaller fish in mind through the coming months, I had downshifted to 50-class Matsuura reels but they held more than enough of the thin strong braid to keep from running out even if the fish got a half mile apart. The crabbing tactic got the first fish to the boat successfully for a quick tag and safe release. Soon after we got Kyle into the chair and started working exclusively on the second fish, he got it to the boat for another release. The whole unbelievable event was over by a little more than an hour after the first strike. Yes,Yes ,Yes My very first catch!